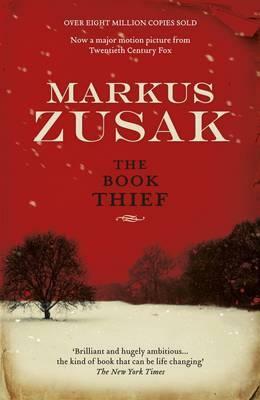 ‘The Book Thief’ by Markus Zusak is a remarkable historical fiction story that catches readers in a whirlwind of love, trust, friendship, and Nazi Germany. The story’s narrator is Death, a feature that immediately sets it apart from other books. Zusak helps personify Death, and make him seem more like a kind individual rather than a haunting entity. Death starts out the story by introducing the book thief. The first time he noticed her was on a train. Liesel Meminger and her brother were being sent to a foster home. They were traveling with her mother when, with one eye open, Liesel saw her brother fall. Death was there; he quickly took the boy’s soul in his arms. Death noticed white, the white of the snow in the unnamed town in which they buried her brother. It was there that Liesel found a book lodged in the snow, The Grave Digger’s Handbook. She did not know how to read, but she kept it as a last reminder of her brother. Liesel was sent, alone, to her foster home, where she met her foster parents, Rosa and Hans Hubermann. Rosa is described as: “having a face decorated with constant fury. That was how the creases were made in the cardboard texture of her complexion.” (p.33). She also washed and ironed clothes for the richer residents of their town. The first real mention of Hans Hubermann was on page 34. “When he turned the light on in the small, callous washroom that night, Liesel observed the strangeness of her foster father’s eyes. They were made of kindness, and silver. Like soft silver, melting. Liesel, upon seeing those eyes, understood that Hans Hubermann was worth a lot.” (p.34). Hans worked as a painter, but otherwise he would play his accordion at the pubs to pull together some extra money. Liesel attended school, and when the teachers discovered that she could not read or write, they sent her down to where the young children were just learning the alphabet. It was an awkward situation, and, as a result, she disliked school very much. One day, Liesel was out playing soccer on the street when she met Rudy. Rudy Steiner, to be exact, was eight months older than Liesel, had blue eyes and lemon color hair. He liked girls and particularly he liked Liesel. He would often tease Liesel about kissing him. Rudy was obsessed with Jesse Owens, the first African-American runner to win the Olympic gold medal. He admired Owens so much that he painted his body black and ran down the road in the middle of the night, pretending to be Jesse Owens. A few months into Liesel’s stay, Hans suddenly discovers The Grave Digger’s Handbook, during a bed-wetting nightmare incident. He offers to teach Liesel how to read, and this resulted in the midnight classes. Liesel was advancing to the upper classes, and she was enjoying life when the book burning arrived. She was part of the Hitler Youth, and it was mandatory for them to go to the book burning. Liesel was horrified when she saw the burning books, so after the event, she walked up to the pile of papers and books, and saw, in the corner, a book, just barely burned. The Shoulder Shrug, it was called, and she stole it. All was well, but the times were disrupted with the arrival of a man. Max Vandenburg, a Jew, walked into Liesel’s home. Max’s father was friends with Hans, when he was in the army in WWI. He saved Hans’ life, and he was forever grateful. Max needed a hiding place from the Nazis, so he made his way to the Hubermann’s in order to find salvation. Liesel quickly became friends with Max. They exchanged laughter and stories. Max even gave her a present, a story that he wrote himself. Suddenly, something happens that alters the course of their lives forever. In ‘The Book Thief’, Liesel discovers that family doesn’t always have to be your parents. Sometimes, family is someone who stays by your side until the very end. Someone who trusts you. Someone who can make you smile in the darkest of times, someone who can make you feel alive again. This book was beautiful, and the ending nearly brought me to tears. It is a must-read for anyone who enjoys reading books with deep emotions hidden inside, friendship, and love. Zusak portrays the characters with such depth and emotion that it’s hard not to get pulled into the story. When a character felt sad, I felt a twinge of sadness in my heart. When they were happy, I found myself laughing along with them. This book was beautiful, a work of art, and I definitely would recommend ‘The Book Thief’ for someone to read.